This is a dish that’s quick to prep and cook but does need time to marinate in order to taste its best. 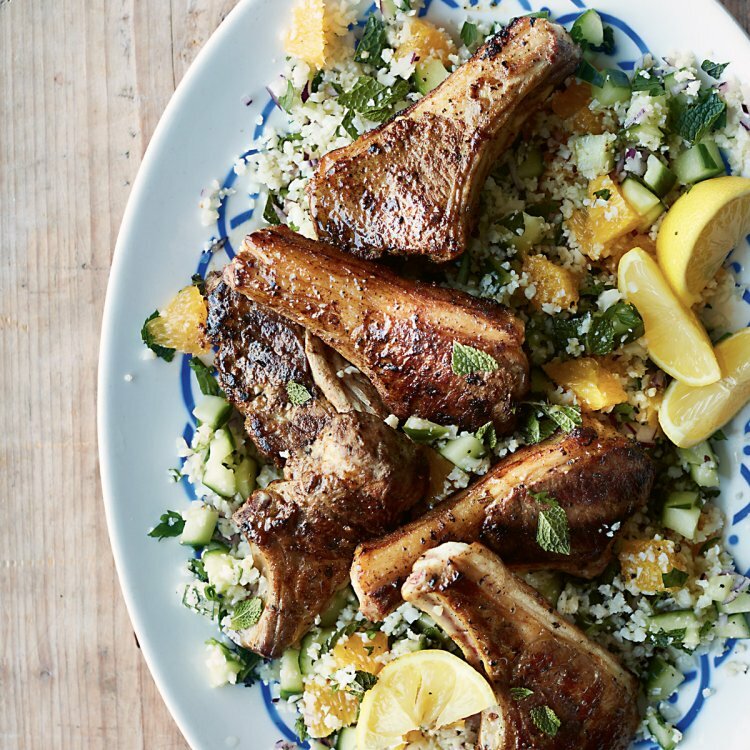 I love lamb but it is quite high in calories so it’s good to serve it with this low-cal but totally lovely cauli couscous. Ras-el-hanout is a North African spice mix and you can buy it in supermarkets. 1. Put the lamb chops or steaks in a dish and season them with salt and pepper. Mix the spice mix or ras-el-hanout with the lemon juice, garlic and 4 tablespoons of olive oil. Pour the mixture over the lamb and massage it into the meat. Cover the dish and leave the meat to marinate in the fridge for at least an hour or overnight. 2. For the couscous, blitz the cauliflower in a food processor until it resembles breadcrumbs. Cut a small slice off the top and bottom of one of the oranges and sit it on your work surface. Cut away the skin and membrane, following the contour of the orange. Dice the orange flesh, removing any pips and any large pieces of membrane. Pour any juices into a jug or bowl and squeeze out any juice from the membrane. Repeat with the other orange. 3. Heat 2 tablespoons of oil in a large frying pan. Add the cauliflower and stir it for a minute or so, then add about 100ml of water. Cook over a medium heat for about 5 minutes until the water has evaporated and the cauliflower is dry and opaque looking, with the raw edge taken off, Tip the cauliflower into a bowl. When it has cooled down, add the orange flesh and juice, herbs, cucumber and red onion. Mix thoroughly. 4. Remove the lamb from the fridge an hour before you want to cook it. Heat a griddle pan (or prepare a barbecue) until very hot. Grill the chops or steaks for 3–4 minutes on each side until just pink in the middle. Leave them to rest for at least 5 minutes before serving with the cauliflower couscous and lemon wedges.